Welcome to the Best Western Plus A Wayfarer's Inn & Suites! 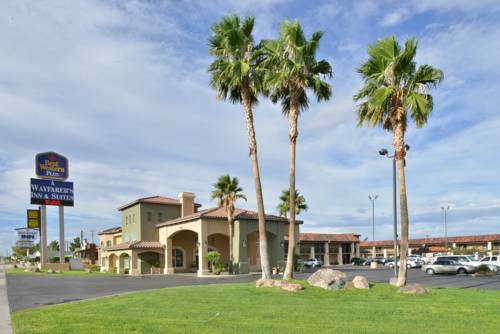 Whether you want the great outdoors or a day trip to Las Vegas, the convenient location of our Kingman hotel can make it happen. When guests stay along Route 66, they have the best of the desert at their fingertips. Our Kingman hotel puts the comfort of guests first, starting with genuine hospitality. Whether you're traveling solo, on a romantic road trip or have the whole family in tow, a great hotel can make the difference between a good and fantastic vacation. Repeat customers are standard at our Kingman hotel, and we have excellent TripAdvisor ratings. Cleanliness goes hand in hand with being a pet-friendly hotel here. Enjoy a free, hot breakfast each morning, which is just what you need to get started on the right note. Indulge in a buffet of hot waffles and flaky pastries, fresh fruits, cereal, yogurt and 100% Arabica coffee or cold juices. We are a roadside motel along Interstate 40, catering to all travelers. People stay with us en route to somewhere else such as the Grand Canyon, Las Vegas, Phoenix, Los Angeles, the east coast or to ride Route 66 on a Harley . However, just because we're a favorite stopover doesn't mean we skimp on the amenities and service. Business travelers with Unisource Energy, Praxair, the federal government and the State of Arizona employees often stay with us. The luxury bedding, cool rooms and friendly service make you feel at home. When on a long road trip, a relaxing stay in a quiet room can make a world of difference. From an epic Harley ride to a cross-country road trip, let our staff make your trip just a little easier. Book your upcoming stay at the Best Western Plus A Wayfarer's Inn & Suites and discover the best hotel en route to wherever you're headed! Enjoy your stay. From: Interstate 40. The Best Western Plus A Wayfarer's Inn and Suites is located off of Interstate 40 at Exit 53. We are 500 feet from the exit on the right hand side and east of the city center.